When you’re trying to make deep-fried foods at home, what do you usually prepare? Of course, there has to be the right set of ingredients, but don’t forget about using the best deep-frying pot. 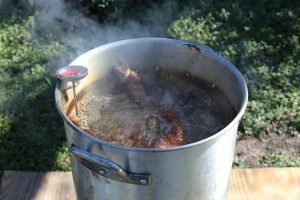 In this post, we’re going to explain how you should go about choosing the right pot for deep frying. We’re also going to introduce our top recommended pots for deep fry cooking in a ranking format. Give your friends and family the gift of delicious deep-fried food with the right pot. 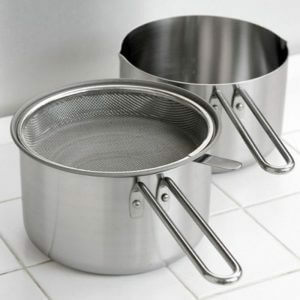 Deep-frying pots are available in different materials, shapes, and sizes. In this segment, we’re going to introduce the essential factors when you’re choosing the right pot for deep-frying foods. Let’s start by taking a look at the size of deep-frying pots. You’ll want to choose the right size to cater to the right group. You should also consider the size of your cooker because you don’t want a pot that’s either too large or too small for it. While you’re browsing the Internet or walking around a department store for the right pot, you should imagine the scene where you’re going to use the cookware. If you have a small cook-top or if you’re living alone, then a deep-frying pot of about 16 centimeters should be just right. 22-centimeter pots are ideal for when you’re preparing food for a family of four. Also, some small-sized pots are at risk of catching fire, especially if it’s too small to fit the surface of a gas stove. It’s in this regard that you should always choose an appropriately-sized deep-frying pot to avoid any “fiery” incidents. Deep-frying requires oil to be at an appropriate temperature level to achieve that crispy finish. Pots with proper insulation can also effectively encapsulate the taste in the food. Still, it does depend on the material of the deep-frying pot, along with its heat retention capacity, cleanliness, and durability when we’re talking about its ability to help you cook delicious food. Let’s look at the characteristics of each material by order of increasing insulation power. 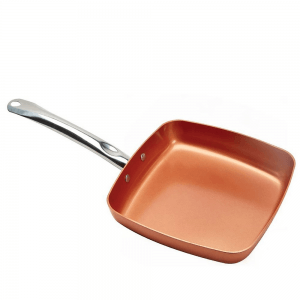 Out of all the materials for deep-frying pots, copper has the most excellent regarding heat retention ability. 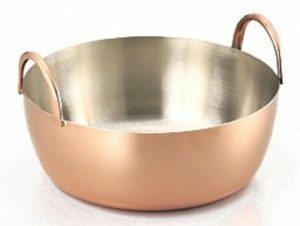 Copper can easily transmit heat, and many professional chefs use copper pots. Many household cooks also use copper deep-frying pots because of the significant utility it brings to the kitchen. Even though it has great heat retention, copper also has the fastest ability to degrade or oxidize oil. 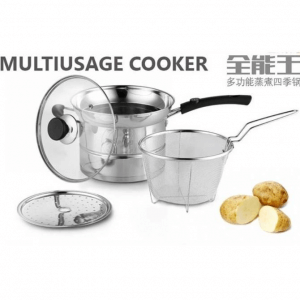 Therefore, it’s not an ideal choice for users who want to reuse cooking oil several times. Also, copper pots are quick to discolor. Users should quickly remove the oil, and let the pot dry thoroughly after washing and cleaning. Also, make sure to use a soft sponge with a neutral detergent so that the material won’t discolor fast. Iron comes in second place regarding heat retention. Keep in mind that cast iron is more expensive than iron, but many professional chefs prefer the former than the latter when deep-frying foods. Cleaning iron pots are also relatively easy. Just wash the pot with water after taking out the oil. There’s no need to use cleansers or detergents on it. However, iron or cast iron pots can easily degrade oil so it’s not ideal for reusing oil. Stainless steel deep-frying pans aren’t good at retaining heat. However, steel doesn’t deteriorate oil as fast as iron or copper. Stainless steel is also resistant to rust, scratches, and deformation. It might be a very long time before you’re going to replace a stainless steel pot because of its high durability. Cleaning stainless steel deep-frying pots is also relatively easy. Just remove the oil, and then wash it thoroughly with a sponge mixed with a neutral detergent. Aluminum has the lowest insulation power out of all the materials for deep-frying pots. However, it’s also the most inexpensive of the bunch. Another advantage to using aluminum pots is its natural ability to retain oil. Chefs who plan on reusing oil several times may want to look for aluminum pots. Still, it’s easy to scratch or deform aluminum. Don’t use metal brushes or scourers when cleaning these pots. Although we’ve already explained it in our “Pot Material” section, it’s important to choose a deep-frying pot with excellent heat retention. However, the pot’s heat-keeping power also depends on the shape of the product. A deep pot can let you put more oil into it, which can also mean that you can put in more ingredients and the temperature won’t change. A deep-frying pot with sufficient depth can greatly assist you in preparing delicious deep-fried food. Another factor that can help increase hear retention in a deep-frying pot is the thickness. Thick pots are heavier than their thinner counterparts, but it also means that heat properly accumulates within the cookware. Some deep-frying pots have spouts to easily transfer oil to another container. However, it doesn’t mean that pots without spouts are no good. “Spout-less” pots are still great for their straightforward designs, which means it’s easier for storage. 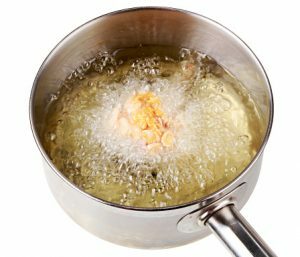 Still, deep-frying pots without spouts might leave some oil behind when you’re trying to transfer oil to another container. Just remember to properly and thoroughly clean the pot each time you remove the oil. Small to medium-sized pots tend to have a long handle for easy carry with one hand. 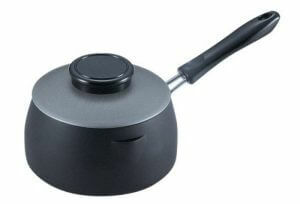 Long handles also allow you to easily change the angle and position of the pot during cooking. However, there are some deep-frying pots that do have short handles. If a pot has short handles, then you may want to use gloves or mittens every time you take the cookware out of your cooker. In this segment, we’re going to introduce our top pots for deep frying in a ranking format. We’ve considered our choices by looking at their features like heat retention, ease of use, and durability. One immediately apparent feature that comes with this deep-frying pot is the thermometer. This element allows you to have perfect temperatures at all times whenever you’re cooking with this product. Aside from the thermometer, its iron construction makes cleaning a breeze. 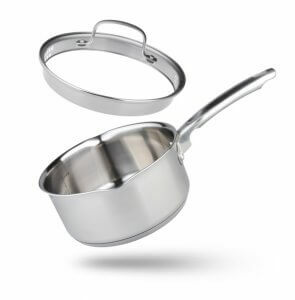 This cooking pot is also great for use on a gas range or induction cooktop. With its 7.55-inch diameter and 5.39-inch depth, it’s a great choice for preparing dishes for a small group. Lastly, the accompanying cast iron lid comes with a tray to hold pieces of food or ingredients for convenient cooking. These stainless steel pots are among the most beautiful-looking cookware you’ll see on the market. All of the pots in the set are safe for use on induction cookers. This set is a great choice for people who like to serve dishes or if you’re living alone. Even though two of the three pots have a decent size, one of them is a bit smaller than most. You can cook really small meals with it (or if you’re planning to cook noodles for one person). If you want to cook food for yourself or for a group of 5 people, then this deep-frying pot might be a good choice to help you accomplish that goal, especially when you consider its 5.31-inch wide base. It is made of 304 stainless steel which has higher durability than other types of stainless steel. This deep-frying pot is safe for use on gas and electric ranges, as well as on induction cooktops. However, it’s not oven safe. There’s even an oil line to tell you that the amount of oil you’re using is just right. A stainless steel rack is also part of the package to make deep-frying a convenient experience. 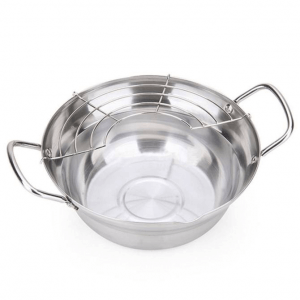 This stainless steel pot is ideal for both deep-frying and steaming foods. It has an 11.8-inch diameter and a 7-inch height. Therefore, it’s a product fit for a medium-sized family or if you want a deep-fryer-slash-steamer to create small dishes. 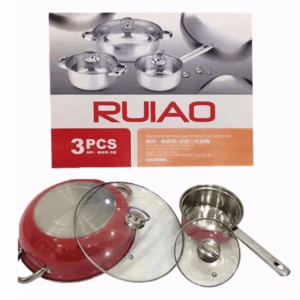 The package also includes a basket and two lids (one glass and one stainless steel) for various cooking methods. It also comes with with a deep-fry drainer for easy oil removal and a steamer tray to help you cook delicate delicate foods like eggs. You can even make use of the steamer tray for elevating some foods so they won’t rest on the liquid below. 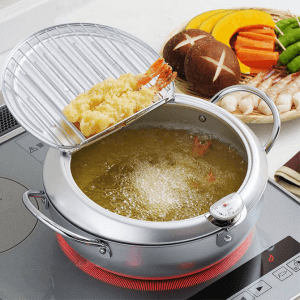 If you want to make tempura or other deep-fried foods less oily, then this cooking pot can assist you in achieving that objective. It has an oil dripper that hangs from the side of the pot to help you easily remove excess oil. Furthermore, this pot has a narrow bottom to help you keep the use of oil in check. Its 8-inch diameter opening makes for an easy way for adding food to the pot. This deep-frying pot is ideal for preparing small dishes because it only has a 3-inch depth. Additionally, this pot has a weight of 1.3 pounds which is decent enough especially when you compare it to other cooking pots on the market with similar sizes that weigh about 5 pounds. Have a taste of old-style cooking with a modern twist with this cooking pot. This cookware looks like a traditional cooking pot, but it has some contemporary features like a metal basket for catching food and an excellent compatibility to present-day cooktops. Its cast iron material is both pleasantly looking and durable at the same time. Additionally, its 5.5-inch depth is great for deep-frying foods fit for a single person or a small family. 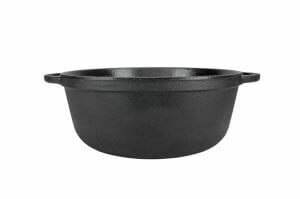 Lastly, its 4.8-pound weight is reasonable enough compared to other cast iron pots that you won’t have to pull a lot of muscle in transferring food or when you’re about to put this cookware away for storage. 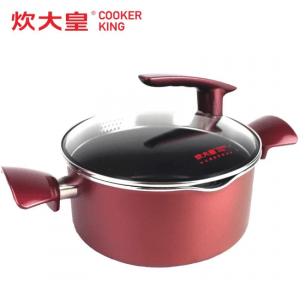 This cooking pot offers excellent durability as compared to other similar products on the market. It offers a 5 layer construction that gives different benefits. First, it has a double top layer made of a polish ceramic coating without Perfluorooctanoic Acid (PFOA). Next, there’s non-stick ceramic-coated layer followed by an aluminum core for excellent heat distribution. The outside layer can withstand high temperatures, and the final layer is an induction base to heat oil and food fast. 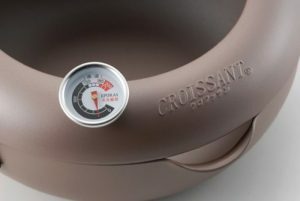 This cooking pot is even oven safe up to 450-degrees Celsius. 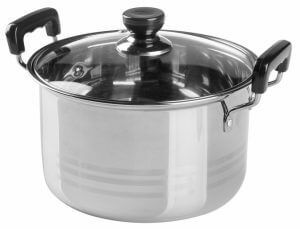 As such, this product is an ideal choice if you’re looking for a very durable and functional cooking pot. This non-stick deep-frying pot mixes things up in the design department. You’ll immediately see that the handle is connected to the side of the lid instead of the center. This design choice makes it easy to lift the lid whenever necessary, and with minimal worry of getting your hands burnt in the process. 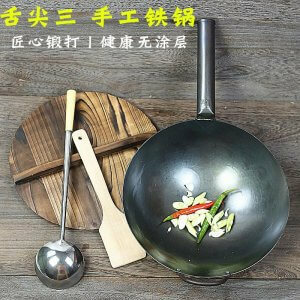 Furthermore, its aluminum alloy construction makes it have above average heat retention capabilities as compared to the traditional aluminum cookware. Also, its 4.4-inch depth and 8.67-inch diameter are ideal for deep-frying small to medium-sized dishes. 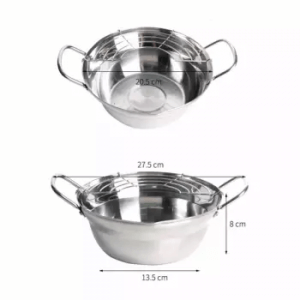 Different deep-frying pots have varying sizes, shapes, features, and other factors. The items introduced in this page have been carefully considered to help give you the best deep-frying experience. Choose a pot from our list by considering their looks and features, and make sure to think about your budget as well. With the right pot, you’re going to serve tasty deep-fried food to your friends and family every time!